If the vertical crosshair of your scope is cocked to one side (as most are) you will not burn in hell for it, but you will miss shots you take at long range, because the bullet will not be flying in alignment with your sight and will depart, either to the right or left, when it has gone some distance from the muzzle. Over the years I’ve tried various devices that allegedly align your scope, but none of them worked, so I relied on my eye, which usually led to hours of excellent fun and a blood-pressure spike of 325/182. But here, by crackey, is one that works. It’s called the Segway Mk-II Scope Reticle Leveler, and it is absurdly simple. You can even understand the directions. The price is $24.95 and you can get it from Brownell’s (brownells.com). It will save you all sorts of grief. Second: Second only to Africa, Alaska has the greatest hunting in the world, and the terrific thing is, it’s not Canada. You don’t have to pay Air Canada $100 extra to fly your guns (and then lose them) or put up with the B.S. import permit or the fee that goes with it. Also, Alaska is probably the last place in North America where you can fart, have long nose hairs, curse, and generally let the badger loose. But I digress. In 1997, an Alaska guide named Dennis Confer wrote Hunt Alaska Now. It's an absolutely terrific book, loaded with information and practical advice. Now there’s an updated, expanded 2006 version, and if you have any thought of hunting the Last Frontier, you gotta get a copy. It’s a paperback, 365 pps., $29.95 from www.tonyruss.com. How Long Does Gunpowder Live? For those of you who worry about the health and well-being of their smokeless powder, here’s a story. Around 1980, I had a co-worker who was sunken-ship crazy, and since I was a Titanic and Edmund Fitzgerald nut, we found a lot to talk about. One day he came into my office with the grubbiest-looking .30/06 round I’d ever seen. “Do you think the powder’s any good?” my friend asked. “Let’s find out,” said I, and punched a hole in the brass case with my thumbnail. Not that I have strong thumbnails, but the brass was corroded that badly. I poured some in a glass ashtray (yes, offices had ashtrays then) and, violating 25 building-safety codes, tossed a match (yes, people had matches in their desks then) into the powder. Whoomp, it went, and burned with a brief, merry flame, just the way gunpowder is supposed to. And this after 62 years under the Atlantic Ocean. Amazing. To put this in perspective, you must be aware that if you are left-handed, and spend all your spare time looking at fine guns, you will go about 15 years before you see a fine shotgun that’s stocked for a southpaw. And then another 15 before you see the next one. No kidding. And so in 1990 or so, when I walked into my gunsmith’s shop and he had a smile of purest evil on his face, I knew it was trouble, and I was right. In lieu of cash, a customer who owed him a lot of money had given him a Perazzi Special Sporting o/u shotgun. 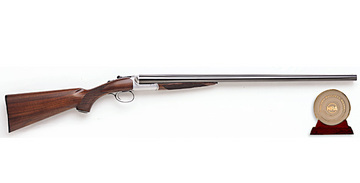 It had a color-case-hardened receiver, special wood, a spare trigger group, ten screw-in chokes, and it had been stocked to fit him at the Grand American Trap Shoot at Vandalia, Ohio, right at the Perazzi booth. And it was stocked for a southpaw. I mounted it, and there was no doubt that this gun was made for me. The guy they built it for had been at Vandalia, but it was meant for me. It was a heavy, long-barreled gun, about the only kind of shotgun I can shoot worth a damn. Now when you reflect that 16 years ago a single Perazzi choke tube was worth about $200, and a trigger group went for $500, and this wasn’t even the gun we’re talking about, I was faced with a choice—give up a whole bunch of rifles or walk away from the shotgun of a lifetime. I gave up the rifles—real good ones, too—and cash, and I got the shotgun, and have never regretted it. I only own three shotguns, and I use that gun for just about everything, and I can’t even tell you any more what rifles I traded to get it. And the moral is, once or twice in a lifetime you’ll see a gun you know is meant for you, and you should do whatever is necessary to get it. Excluding, of course, capital crimes. In April 1996, Layne Simpson, Gary Sitton, Finn Agaard and I met at gunmaker Kenny Jarrett’s South Carolina establishment to do a massive and earth-shaking piece on deer rifles. In the spare time I had, I went rooting (not unlike a hog after truffles) through Kenny’s inventory room where he keeps finished guns and found a left-hand .30/06 based on a Remington Model 700 action. It was a demonstrator gun that Kenny kept around to show his southpaw customers, but it was not quite glamorous enough for that purpose, being all black (no camo or Confederate flags) and in the distinctly unglamorous .30/06. And it was heavy--8 1/2 pounds without scope. But I loved it at first sight, and when Kenny quoted me a price that was less than the Bolivian GNP, I said I’d buy it if he sawed off the muzzle brake, so he did, and I did. Smartest money I ever spent. When they come to pry my gun from my cold dead fingers, this is the rifle they will pry. It is not only very accurate (groups as small as .600-inch) it’s accurate with anything you stuff into it. I think you could feed it black powder and .308 lead wire and it would shoot well. It will not shift its point of impact even when shot hot, and it never ever malfunctions. I’ve shot it in competition for 10 years, much of that rapid fire, and it’s never bobbled through a couple of thousand rounds. I’ve killed my two biggest whitetails (in Arkansas and Saskatchewan) with it, and my biggest mule deer (Wyoming). It’s unglamorous, but it’s also the rifle of a lifetime. When a rifle is fired, its barrel twangs; I’m told by an engineer who has studied the subject that if you could watch it in slow motion, the tube would appear to appear to shimmy like a snake (waddle like a duck; that’s the way you do when you do the huckle buck). Anyway, the purpose of bedding the barrel is to make sure the damn thing shimmies exactly the same way for every shot. The easiest way to bed a barrel is not to bed it—free-float the sucker from where the chamber swell tapers down right out to the end. Then let it do whatever it wants. Most factory rifles are made this way because it’s cheap and usually works very well. Melvin Forbes of New Ultra Light Arms beds his fore-ends so they just touch the barrel. There’s no pressure, but there is a dampening effect. Melvin is able to do this because his Kevlar-graphite stocks are as rigid as I-beams, and once they’re bedded they stay put forever. Top-line custom gunmakers who work in wood have long believed in full-length bedding (you need good, dry wood and a lot of skill to do this), and some of them like to shape the fore-end so it puts upward pressure on the barrel, although there are people who will tell you that wood being what it is, there’s no real way to achieve this. Reinhart Fajen, the stockmaking company of yore, used a variation on this system. They’d free float the barrel except for two little bumps that sat 45 degrees apart about 2 inches back from the fore-end tip. This system was supposedly immune to the problems of full-length bedding, but had the same overall effect.